I have had a great deal of academic fun reading Ondrejka's 2004 article "Escaping the Gilded Cage: User Created Content and Building the Metaverse" (get a copy here). I'll provide a few page references below, but not a works-cited list (this ain't no formal article, yet!). This article will argue that creating a defensibly real, online world is now possible if its users are given the power to collaboratively create the content within it, if those users receive broad rights to their creations, and are able to convert those creations into real world capital and wealth. This would be the Metaverse of Stephenson’s imagination. (Ondrejka 4). Ondrejka, a supporter of Cloud Party, is still at it, and I like the way that new virtual world has seized the creative fire that Second Life, with its balky interface and legacy code, may never achieve. Cloud Party already has an avatar building kit, and while the results do not match what we have in 2012 SL, they are impressive for a world so young. As I get ready to play Patterns for the first time, however, I also wonder if it's too early to count Linden Lab out of the game. What did Ondrejka want in 2004? Here are a few claims he makes that excite me still. I won't focus on the author's economic musings. They are fascinating, but I'm more concerned with his arguments about engagement and immersion. People want to be perceived as creative by customizing their surroundings. People want to have their moments on the stage. In many cases, it seems that users are just waiting for access to the right tools (Ondrejka 9). Due to the in-world tools and lack of a submission process, Second Life’s users have been able to create an amazing amount of content. At the end of May 2004, users had created more than one million objects, over 300,000 objects with scripted behaviors, and over 300,000 pieces of clothing (Ondrejka 10). I have long argued that UGC is the "special sauce" keeping me interested. I can destroy things in a thousand games, but in how many can I make them? Eventually, both sorts of play will co-exist. What we call on my weekly Nerd Night "the minimum daily requirement of violence" in games will only take us so far. If game designers want to attract my sort of relatively well-heeled customer and hobbyist, they need to consider two sorts of sandy spots where a type of "play" occurs: the sandbox and the arena. Ondrejka notes that when one drops and object, one expects it to fall. To fall back on a favorite expression of mine from Snow Crash, designers must not "break the metaphor" by, say, letting folks "beam in" to any location. Though many sims in Second Life support that type of movement, it's more predictable that one would walk or drive from a fixed point to the destination; this is what the original Linden Lab "telehubs" wanted to do. Not breaking metaphors, whether gravitational or spatial, is predictable behavior. Ondrejka contends that successful metaverse must support behavior that only emerges with creative play (15-16). In my OpenSim House of Usher simulation, for instance, I had no way to injure other characters when I was in the role of Roderick. I found that, however, I could rid myself of over-inquisitive guests by pushing them off the edge of the virtual region I rent at Jokaydia Grid. This was a software bug in OpenSim, but it served my purpose: through emergent behavior, I'd found a way to drown nosy and suspicious visitors to The House of Usher. So When Do We Get our Metaverse? Something that I tended to think was unfortunate about certain MMO storytelling... you get these narratives where the NPCs have lots of really emotive things to say to you, and they want to throw you into this narrative. Then on the other hand, your interaction with the characters played by humans -- even if they're inclined to play it in a very role-playing way and they're not running around shouting trollish remarks and that sort of thing, even if they've entered into playing that role, because of the way it's structured, none of the conversations you ever have with them are ever going to be acknowledged by the story as meaningful pieces of the story. I have no time for childish players who type in text abbreviations or talk in voice like extras from The Jersey Shore. I am a snob. I would not even consider RPing in the local game shop; my preferred groups are guys I've known for 30+ years or a bunch of fellow PhDs who were with me during graduate study. Neither group is trollish but both can be a bit silly, to add humor to a gamemaster's crafting of a scenario. Neither group is childish. So how can a game engine ever let players into the story as co-creators, as can happen in an SL roleplay sim or tabletop RP? One of Short's commenters noted that we'd need AI that could serve as a "dungeon master." When will that occur? Quantum computing, a gleam in the eye of many of us, recently got a public boost by the 2012 Nobel Prize in Physics. With processor speeds that fast, we may see something like the magic of Stephenson's vision realized. Until I have that sort of power in my palm or my laptop, I will read the dreams of Ondrejka, Rosedale, Short, and Stephenson and keep hoping. Top hat tip to Hamlet Au, for covering both Ondrejka's and Short's ideas. Thoughtful and all fine and good, but there is no mention here of the fundamental architectural choices that have led Second Life to the place it is today - essentially a lag fest. Those architecture choices have left behind a Technical Debt that can't be repaid and can't be fixed. If lag could be fixed it would have been by now, despite Linden Lab pronouncements that lag is their highest priority issue. Blue Mars and World of Warcraft download their worlds. That was an architecture choice. If Second Life had gone that route we might not be in the pickle we're in today. In Snowcrash there is no lag. There are millions of avatars parading up and down the boardwalk at any one time. 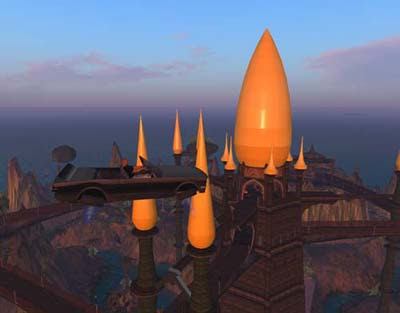 The impractical limit of 60 or so individuals at a sim event proved to be unsustainable for Second Life users who were looking for a Metaverse. Corporate sims all disappeared because it soon became apparent that the number of *hits* on a sim was negligible from an advertising or marketing standpoint. Open Sim is not the solution either because it is a knockoff of the Second Life architecture. The market for a good virtual world is still there if someone were to provide a platform closer to the Snowcrash ideal. Thanks, Wizzy, for that important note. I supposed that brute force alone--very fast processors--could make the vision work. Perhaps they could if you have a world we can download. Oh, but the IP issues! As for corporate investment, I had a business faculty member spend some time with me in world in 2007. Her verdict on SL? "Not enough ROI. The pioneers will leave SL as soon as they see that."